In the summer of 2008 children and young people found a new hero in a 6 foot 4 inch swimmer from Baltimore, Maryland. His name was Michael Phelps. Michael was the youngest of three children in his family. While he was growing up he was tall and lanky,* and his arms swung below his knees when he stood up. Kids made fun of him and bullied him. At the age of nine he was diagnosed with ADHD, attention deficit hyperactivity* disorder. He couldn't sit still or concentrate, and he was always on the move. One teacher told his mother he would never be able to focus. His grades were B's, C's, and a few D's. His two big sisters, Whitney and Hilary were good swimmers. Whitney even finished sixth in the 200 butterfly at the 1996 Olympic trials. Michael also became interested in swimming and his mother encouraged him to swim. It was an outlet for his abundant energy and the lane markers tended to give him the structure he needed. He loved swimming. When he was 11 years old he began to work with Bob Bowman, a swim coach, and Bob began pointing him toward the Olympics. * Bob, who had the North Baltimore Aquatic* Club, knew talent when he saw it. When he was young he played other sports such as baseball and soccer in addition to swimming, but by the time he was 11 he knew he had found his niche* and concentrated on swimming. He made his first Olympic team in Sydney, Australia in the 200 butterfly race in the year 2000 when he was just 15 years old. At the Olympics in Athens in 2004 he won 6 gold medals and 2 bronze medals. At the 2007 world championships in Melbourne he won 7 gold medals. Most recently in the 2008 Olympics in Beijing, China he won 8 gold medals! This topped swimmer Mark Spitz's thirty-six-year-old record of 7 gold medals which he won in the Munich Olympics in 1972. 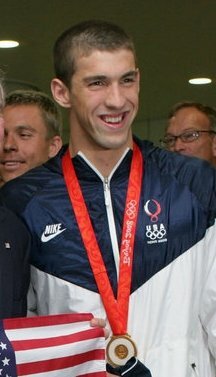 Mark Spitz called Phelps "The Greatest Olympian". Others will disagree citing athletes in different fields such as track and gymnastics. And some athletes excel in multiple sports, but Michael Phelps has won the hearts of the nation because of his accomplishment. 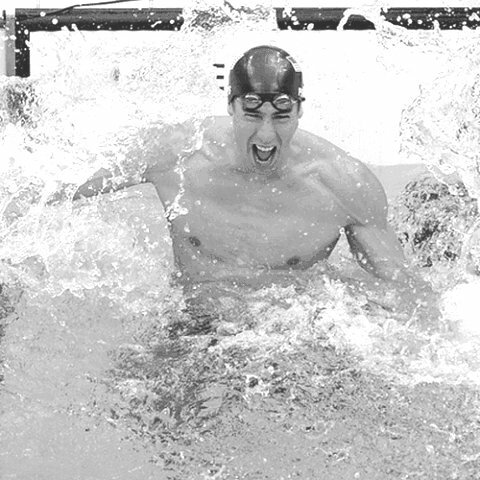 Phelps swims 7 days a week, two to five hours a day. He doesn't like to be a loser. He likes to win whether it's a video game or a race. If he loses, he just works harder so he can be a winner the next time. His life revolves around swimming, sleeping, and eating. Swimming burns a lot of calories, and he eats a tremendous amount of food; 8,000 - 12,000 calories* a day. This is five times as much as the average man eats, but don't try this at home unless you want to swim several hours a day, or before long you will be waddling across the room instead of walking. Michael's third grade teacher wrote a letter to his mother telling how proud she was of him. She said perhaps it had never been focus he lacked, but, rather, a goal worthy of his focus. Michael says, "If you dream as big as you can dream, anything is possible." Press "Go" to search for books about Michael Phelps. This page displayed 124,080 times.